Lane County is a huge county covering Florence on the coast to the Cascade Mountains in the east. We had the opportunity to explore four of its many museums in and near Eugene. 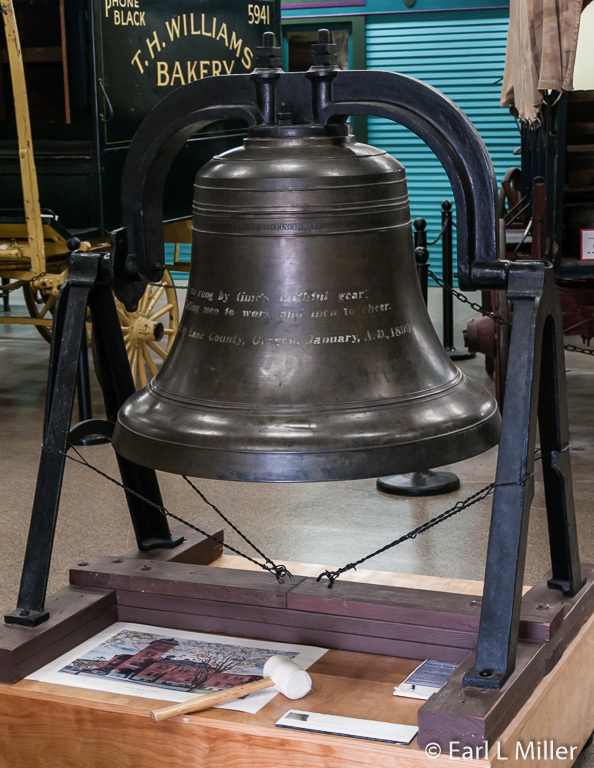 Lane County Historical Society traces the county history. 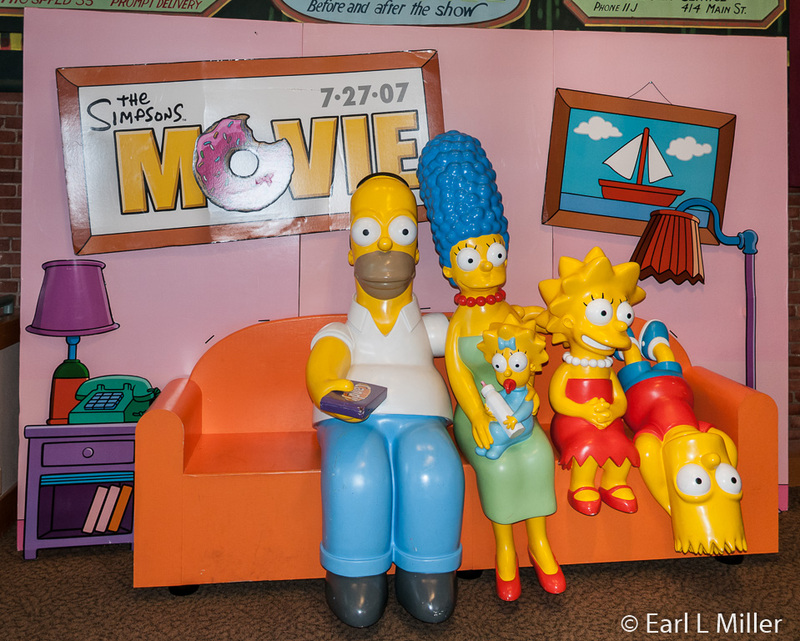 While at Springfield Museum, you ‘ll learn this town’s past including the connection between Springfield and “The Simpsons” television show. I’ll cover these museums in this article. In my next article, Lane County Museums Part Two, I’ll write about Jordan Schnitzer Museum of Art and the Museum of Natural and Cultural History which are located on the University of Oregon Campus. Located at the fairgrounds, this museum dates to 1951 with its current section constructed in 1959. Cal Young, the museum’s founder, was the livestock manager of the Oregon Trail Pageant, a big event which lasted from 1926 to 1950. The museum contains everything from a superb photography collection to a wonderful group of late 1800's/early 1900's wagons and carriages. On the way to entering the museum, check out the historic building behind the fence. 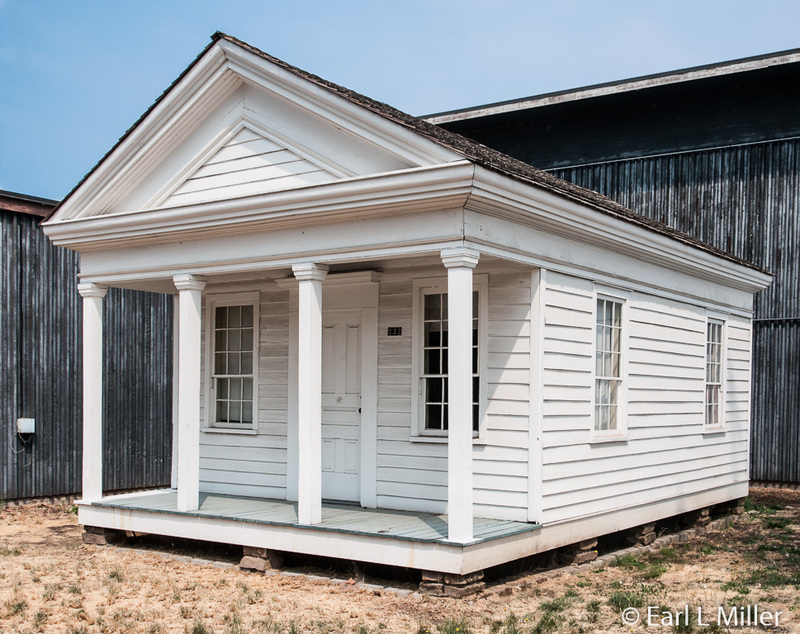 It’s the 1853 Lane County Clerk’s Building, the oldest authenticated building in Lane County, and one of the oldest public structures in Oregon still standing. Sometimes it was called the first court. However, this is a misnomer since court was actually held outside the first two years. It changed hands a number of times including ownership by the Salvation Army from 1937 to 1951. That year, it moved to the fairgrounds and in 1964, it became part of the museum. It listed on the National Register of Historic Places on November 25, 1983. Eugene’s second courthouse was erected in 1898 and torn down in 1959. The current and larger courthouse is in the same location. Fortunately, items from the historic courthouse were saved such as its staircase, a statue of Lady Justice, and the clocktower bell. The museum also has some of its chairs, a desk, and the judge’s bench as well as the courtroom witness chair. You’ll see a painting of this building on the wall. What quickly drew my attention were the nine vehicles on display. 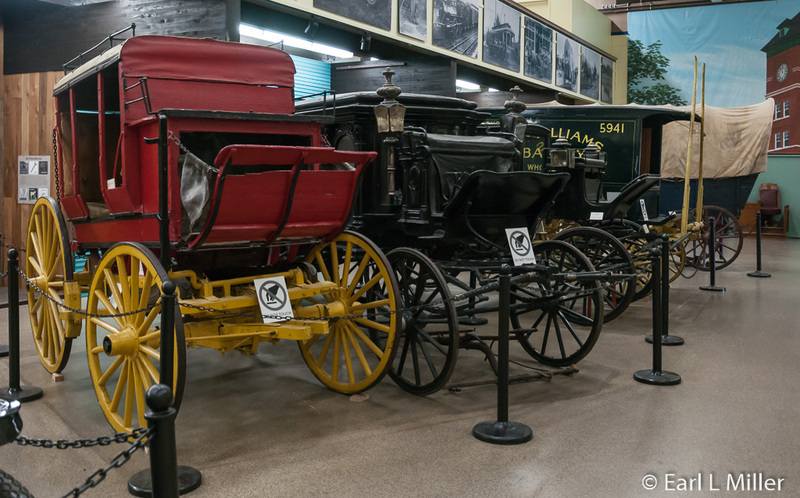 These range from a buckboard wagon, an early 1900's mud wagon, a farm wagon, to a 1910 Model T. You’ll find a T. H. Williams Bakery Wagon used in Canada during the 1930's. It was painted in Basil T. Williams colors and became part of the Oregon Trail Pageant parades. 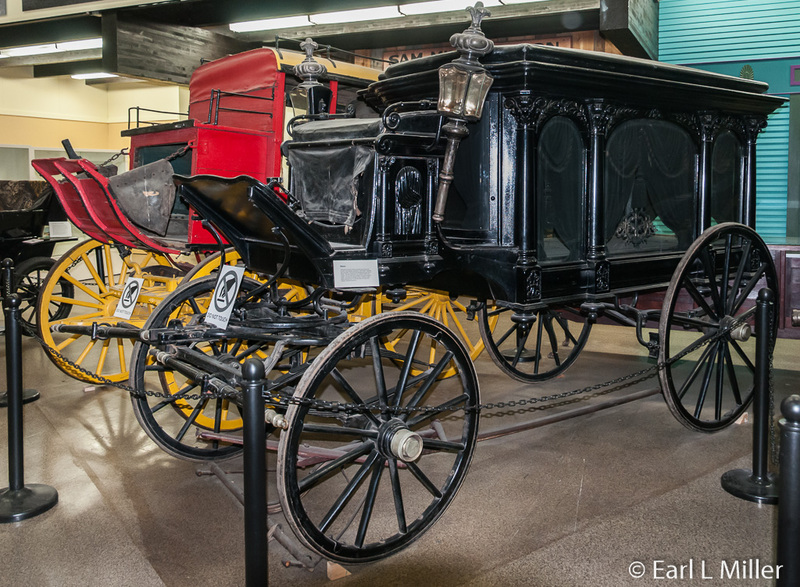 You’ll also notice a Bang Livery Company town coach dating from the late 19th/early 20th centuries, a buckboard which came across the Oregon Trail, and a 1890's hearse. The hearse came from the Ohio firm of Sayers and Scoville. The 1850's covered wagon has an interesting past. Built near Council Bluffs, Iowa, it served as the birthplace for Bianca Reed as her family crossed the Oregon Trail. In 1934, she served as the dowager queen at the Oregon Trail Pageant. 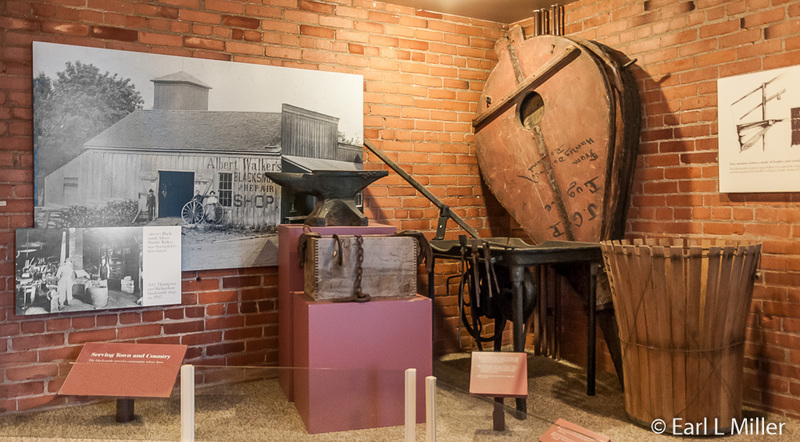 The Reed family had two millstones shipped around The Horn and set up a mill in Winchester, Oregon. Another interesting exhibit is the tree section encased in glass. Silas R. Condra, a pioneer who crossed the plains in 1853, carved on it the date, June 14, 1867. The tree, when it was 200 years old, was cut down in 1960 by a forester at Weyerhaeuser at the Calapooya Tree Farm. The museum has between 15-20 pioneer diaries available for sale. Charlotte Pengra, who crossed the trail in 1853, penned one of these. 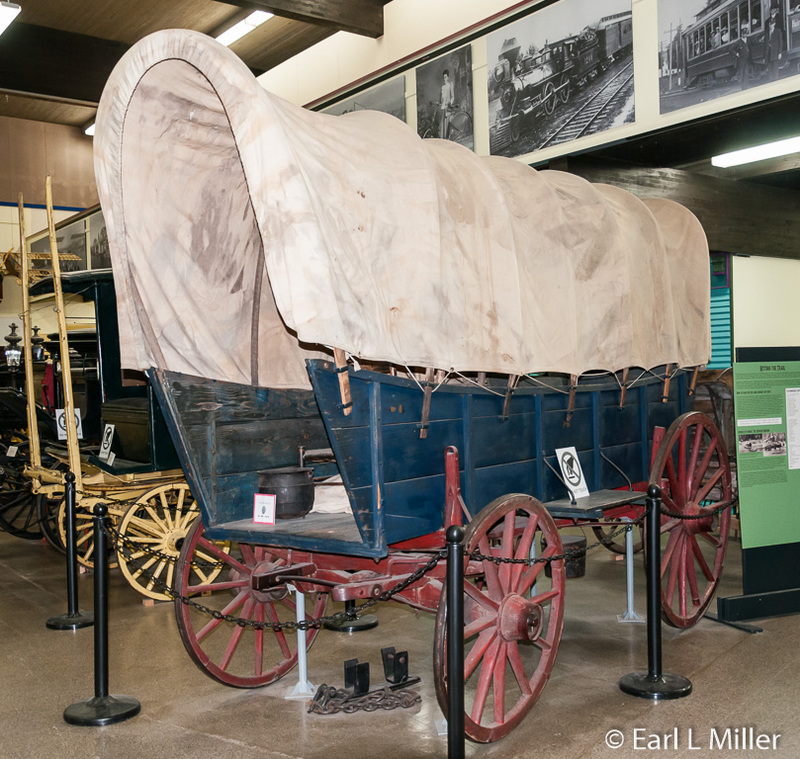 You’ll also find other Oregon Trail artifacts ranging from a sidesaddle to an ox yoke. Shoemaking is also covered. You’ll spot a variety of 19th century tools and “Shoes of the Day” ranging from the 1890's through the 1950's. 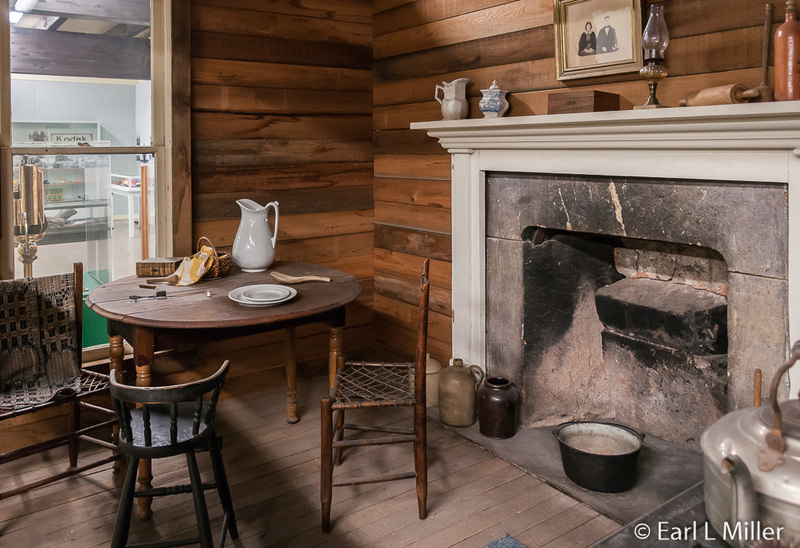 For dioramas, view the 19th century kitchen representing rural life and the 19th century parlor, perhaps, the sitting room of someone wealthy. One of the exhibits of which this museum is most proud is their excellent photography collection. You’ll find numerous cameras and a wallboard containing a brief history of the types of cameras used between the 1500's and 1981. You’ll also notice historic shots from several area photographers dating from around 1900 to the 1960's. Internet users will find the excellent photo collection online. Finally, we saw exhibits on the Oregon Trail Pageant, local theaters, and blacksmithing. Then it was time to check out their museum store. Recently the museum opened a new major exhibit. Visitors, through March, will find the exhibit “No Harm Intended” tracing the medical history of Lane County from 1840-1940. I was told by museum director, Bob Hart, that it occupies much of the museum. You’ll find Lane County Historical Society at Eugene’s fairgrounds. Hours are 10:00 a.m. to 4:00 p.m. Tuesday through Saturday. Admission is $5 for adults, $3 for seniors, $1 for ages 15-17, and free for kids through age 14. The address is 740 W. 13th Street. Call them at (541) 682-4242. 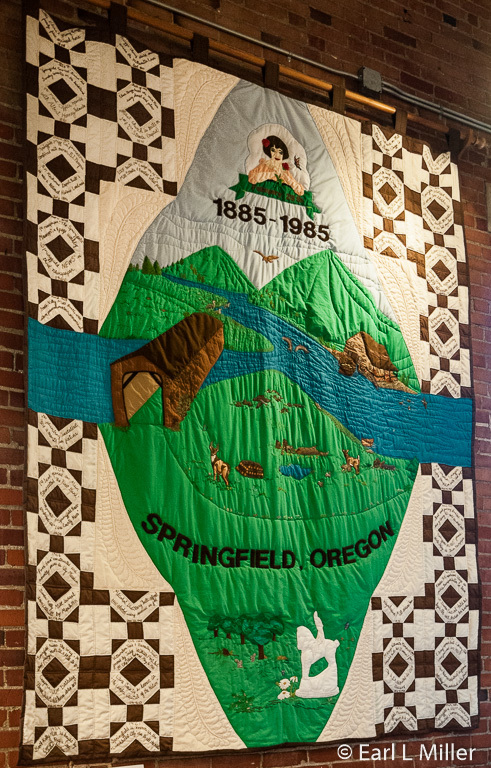 The Springfield Museum is an interesting depository of this town’s history. When we were there, they were constructing their next temporary exhibit on Smokejumpers. We headed to the second floor for its permanent exhibits which you can reach by an elevator or stairs. These are contained in one room. Take time to view their 10-minute video “In the Valley of the Rivers,” an excellent overview of the town’s history which dates back to 1848 when the Briggs family arrived from Missouri. Springfield became incorporated in 1885. 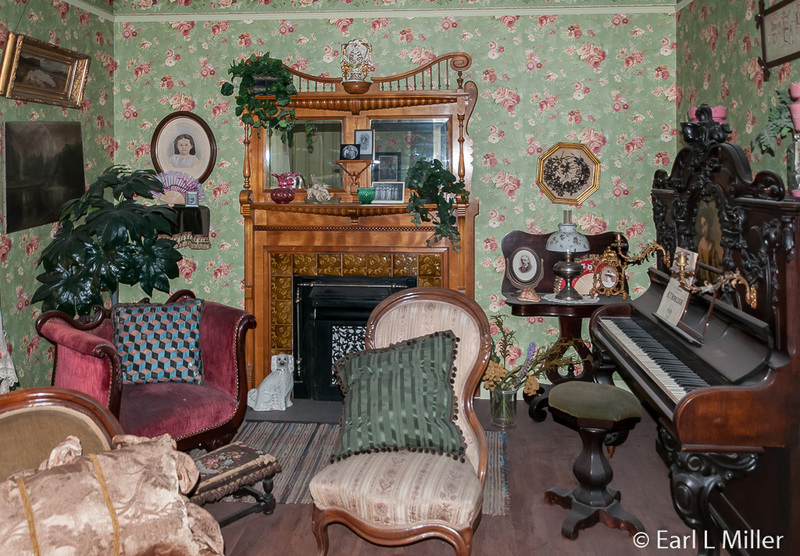 You’ll see a display of household items ranging from a piano to a 1860 circa sewing machine to an iron wood burning stove. A notable community achievement is the centennial quilt you’ll see hanging. It took 3,000 volunteer hours, 20 yards of fabric, and “miles” of thread to make. It was completed in 1985. Another case covers the Kalapuya Indians. Some ran away from the reservation in 1855 and settled in Springfield. A few of their water tight baskets are on display. They alternated between permanent villages and camping in the valley during different seasons. Learn about the railroad wars and streetcar skirmishes between Eugene and Springfield. The Oregon and California Railroad bypassed Springfield in 1871 when a group of Eugene business leaders paid developer Ben Holladay a $40,000 bribe to put the railroad on their side of the river. Springfield got the railroad in 1891 when C. P. Huntington, owner of the Southern Pacific, acquired Dundee and Coburg. He extended it to Springfield. Until the 1950's, the railroad was the major transportation for passengers and freight. The museum has a big display on logging. The Southern Pacific sold forested land to Booth-Kelly Lumber Mill Co., one of Springfield’s earliest businesses. Booth-Kelly built logging camps and acquired workers. It was Oregon’s first all electric mill in 1902. In 1907, it had 400 employees, and by 1911, over half of the town worked for them. On July 28, 1911, when the mill burned to the ground, employees worked hard to prevent the fire from spreading to an oil storage tank west of the mill. If it had caught on fire, it would have destroyed all of Springfield. The company rebuilt the mill in 1912 and stayed in business until 1959 when it was sold to Georgia Pacific. Now the business does “incubation” for secondary wood products industries. Booth-Kelly produced their own electricity and was one of the country’s earliest electric powered sawmills. The company also powered Springfield’s city lights and water pumps in exchange for a 90-year contract from the city. You can view blacksmithing tools, see a portable forge, and learn about the utility companies serving this town. The Springfield Investment and Power Company provided electric service for the Portland, Eugene and Electric Railroad. 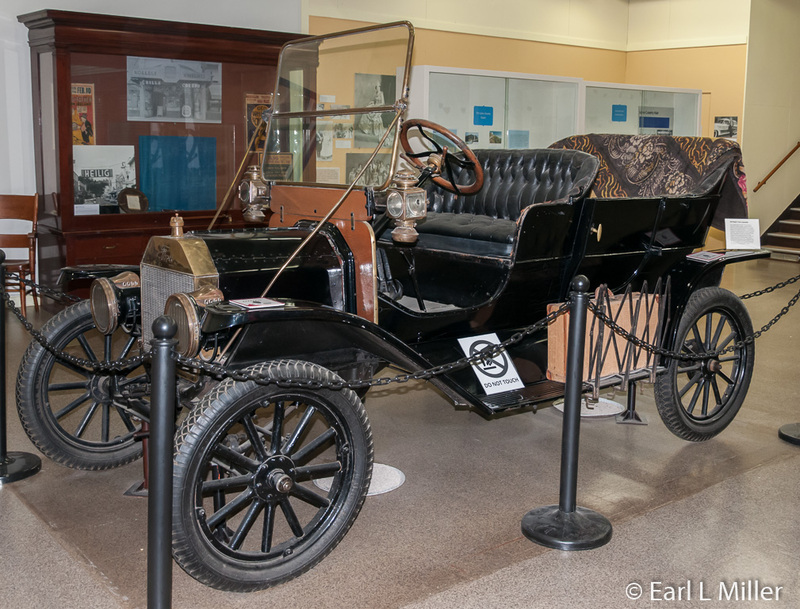 It first carried passengers in October 1910 replacing the stagecoach. The 1907 building, where the museum is now, used to be the sub station for the power company which morphed into Mountain States Power Company in the early 1940's. Hazelnuts have been a vital agricultural crop. Dorris Ranch, run by the Dorris family from 1892 to 1970, is now on the National Registry of Historic Places. Learn more about this in my Outdoors Eugene article. Growing hops was also important. It started in 1882, when Alexander Seavey cultured hops along the McKenzie River. These hops were shipped to brewers in Portland and Vancouver. In early September, hop picking became an annual social event for Springfield. Admission is free at this museum. Hours are Wednesday and Thursday 11:00 a.m. to 4:00 p.m., Friday 11:00 a.m. to 6:00 p.m., and Saturday 10:00 a.m. to 4:00 p.m. Its address is 590 Main Street and the telephone number is (541) 726-3677. 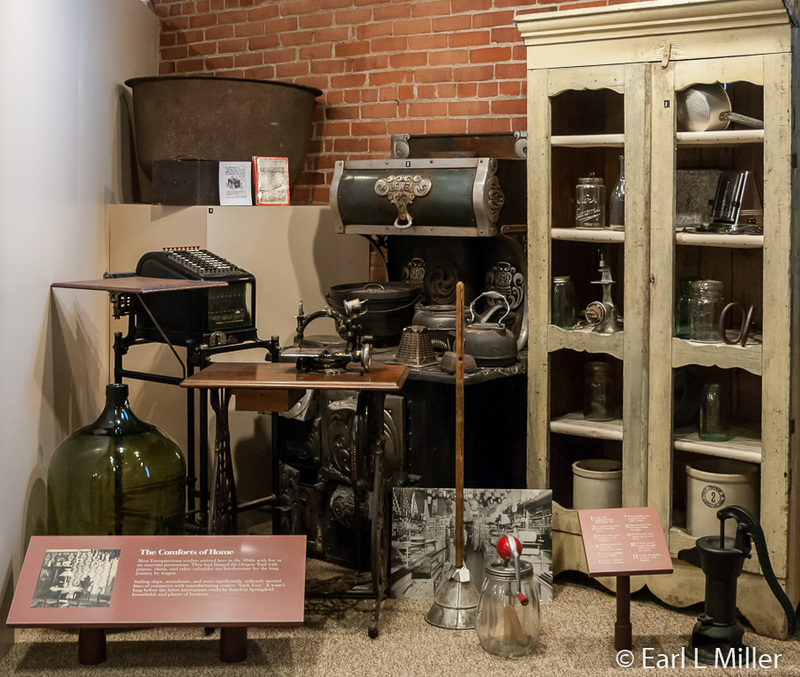 After you visit this museum, head for 500 Main Street. 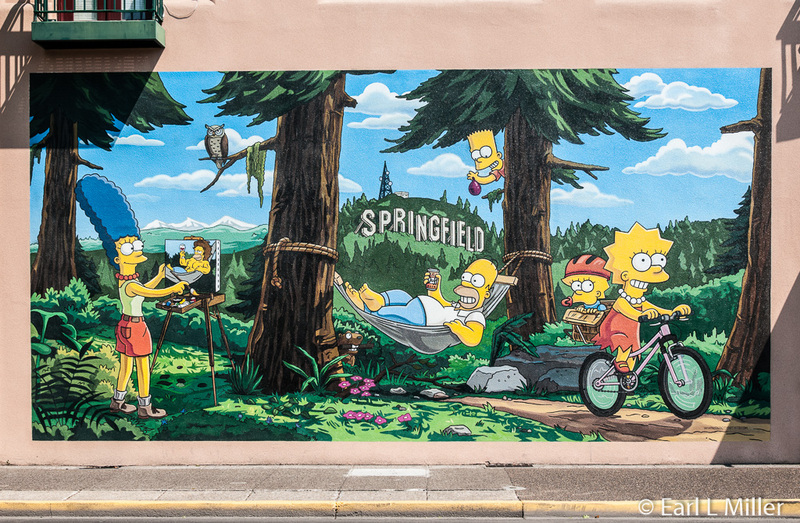 You’ll see a mural of “The Simpsons” on the west wall of the Emerald Art Center. It’s a collaboration by Twentieth Century Fox Film Corporation, print artist Julius Prado, and, Matt Groening. The 15 by 30 foot mural was installed in 2014. Yeardley Smith, the voice of Lisa Simpson, presided over the mural’s dedication. Ohio Hearse at Lane County Historical Museum. This covered wagon crossed the Oregon Trail. 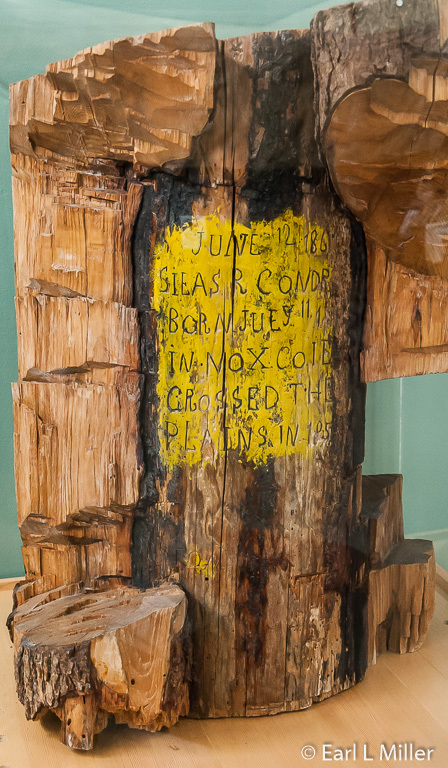 A Tree carved by Silas R. Condra when he crossed the Plains in 1867.